It seems that anthology horror films are making a comeback, and I for one am thrilled about it. I’m thrilled not only because I prefer my horror stories in bite-sized chunks but because a majority of the anthology films that I’ve seen in recent years have been great entertainment. I’ve really enjoyed watching filmmakers try to one-up Michael Dougherty’s Trick ‘r Treat and the found footage V/H/S series of films. Unlike Trick r Treat (a film made for an estimated $12m budget), In the Dark was self financed by creators Chris St. Croix and David Buchert. 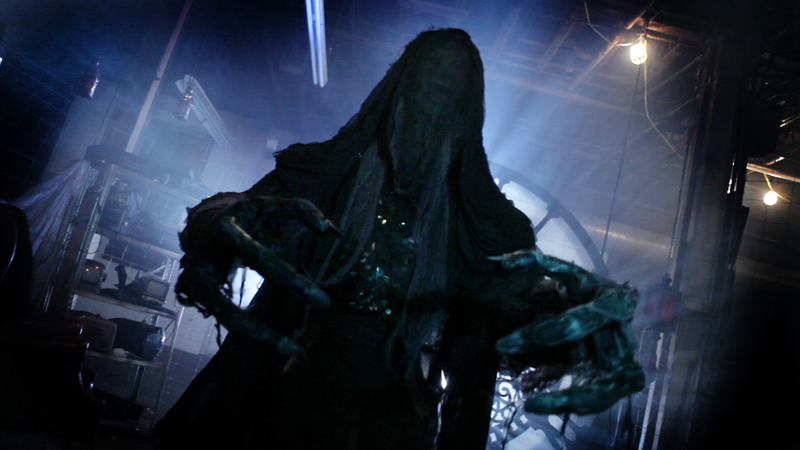 The film was shot in Nashville, TN using local talent and whatever sets and resources the team could scare up. The final product is surprisingly stylized and cohesive. The film opens with a traditional wraparound story. A pair of dangerous women are on the run. They’ve got a severed hand on ice in a cooler that they’re delivering to a mysterious character named Salazar. The ladies are hiding out in a sketchy motel and they find a mysterious bag full of VHS tapes. They decide to kill time by watching the videos, and so the three short films that make up the anthology are presented in this familiar fashion. Some viewers may take issue with the similarity in presentation to another horror anthology feature called V/H/S, but I say that if it isn’t broke, don’t fix it. The presentation works for this film and it doesn’t hurt that In the Dark doesn’t present any of its stories in a found footage format. It differentiates itself from V/H/S by creating three traditionally cinematic, rather than Cinéma vérité horror tales. The creature comes to life! The film feels like a series of homages to some contemporary classic horror features. The wraparound’s musical score is a synth heavy dirge in the style of John Carpenter. The first short titled “The Keeper” has a grungy 90s vibe sort of like The Crow. The set is what I imagine the backstage area at a Criss Angel magic show looks like. The filthy posh Hot Topic-y loft is the lair of a terrible foursome of criminals who receive a visit from a mysterious stranger who drastically changes the course of their evening. Despite the hard rock look of this installment, it is tastefully scored with a string heavy track. This choice added some class to the bloody, violent and bare breasted goings on. A killer is out for revenge! 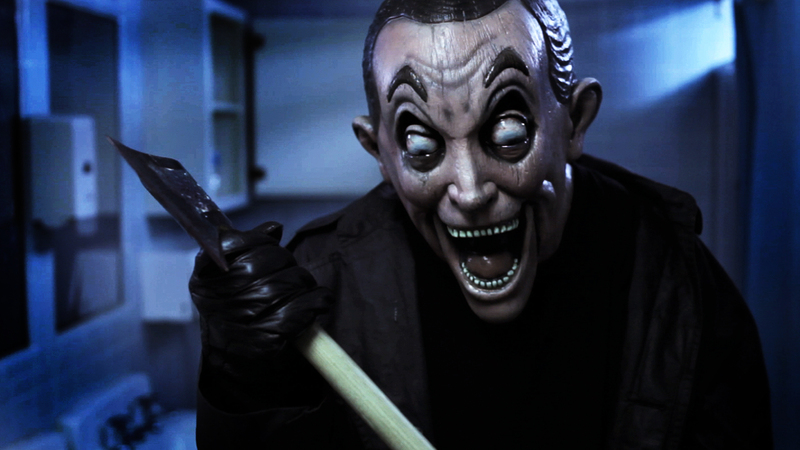 The second story titled “Dummy” plays more like an homage to the stalk and slash films of the 80s and 90s with a little bit of Saw thrown in for good measure. The masked killer in this segment plays strikingly onscreen thanks to a very memorable mask created for the film. The third story titled “To Be Loved” is my favorite of the four. I’m not sure if this was intended by the filmmaker, but this one plays like a tribute to the films of Jean-Pierre Jeunet (Delicatessen, Amelie) with just enough Cronenberg-style gross out gags to make it icky. The performances aren’t as natural as those of Jeunet’s casts, but they are very good. Justin Hand as Marvin plays up his character’s desperate loneliness convincingly and comically. Jayne Salters brings the menace as the voice of an anthropomorphic flesh eating VCR. This segment’s Little Shop of Horrors vibe is hard not to love. The wraparound tale’s conclusion is rushed, but satisfying. The climax feels retconned from the disparate pieces of the other three tales. I didn’t dislike the ending, but I feel like I would have been more pleased with a conclusion that addressed the motel assassins’ dilemma more directly. In the Dark frequently feels padded. Many scenes and some entire sequences are unneeded to move the individual tales along. However, its unfair to fault a self-financed/self-produced/self-edited film for being a little padded. Indie filmmakers often find it hard to “kill their babies” during the editing process. With rare exception, slash and burn editing is not the usual approach for labors of love as every frame of film feels precious to the creator of the raw source material. That said, the diversity of style of filmmaking presented throughout make In the Dark a very impressive effort for a small DIY crew. CAST: Natalie Ruffino, Kelly Mason, Alonzo Mosley, Clay Brocker, Emily Byrd, Katie Groshong, Tristan Jackson, Jordan Stephens, Adam Sanner, Scott Aaker, Olivia Bishop, Leslie Mills, Cooper Guy, Gary Willis, Matt Rosenbaum, Jon Lundberg, Deanna Ramsey, William Harrison, Chase Brown, Luke Phillips, Andria Armstrong, Jennifer Spriggs, Savannah Somerville, Christina Greer, Jace Gray, Jackson Gray, Spencer Barnabee, Justin Hand, Shellie White, Jayne Salters, Vince Cusomato, Wendy Keeling, Shannon Beals, Raven Bryant, Leah Fincher, Judy Jackson, Marcus Gammon, Josh Sadowski, Chris Cavolo, Chris Carson, Peter Jude. SYNOPSIS: IN THE DARK tells the tale of two female assassins hiding out in a rundown motel who discover a bag of unmarked videotapes. With each tape they play, they are drawn deeper into a twisted world where anything can happen. After allowing a mysterious stranger into their underground lair, a gang of murderers fight for their lives against a giant, sin-slaying creature from hell. A masked axe wielding maniac plays a deadly game of cat and mouse with a family in an abandoned mental hospital as revenge for their past crimes. And, when a desperate and lonely man is promised true love by the most unlikely matchmaker ever, he finds that his desire comes at a bloody price. Written and directed by Chris St. Croix and David Buchert and with its genre bending combination of action, horror and dark comedy, IN THE DARK is sure to deliver a slice of gory fun to audiences this Halloween season. The film stars a large ensemble cast including Katie Groshong (Jug Face), Shellie White (Make-out With Violence) and William Harrison (Lawless) and features Special Creature Effects by Rick Prince of Syfy Channel’s Face Off series.